1. I'm a born-again Christian. 2. I spent 22 years in the Army. I retired in December 1993. 3. I was born in California but now live in Texas. 4. I've been married and divorced more than once. I'm currently divorced/single. 5. Politically, I consider myself an independent leaning toward democrat. 6. I have several dogs and cats. I love animals. 7. I have a wicked sweet tooth, which is responsible for my weight. Lately I've had it under control. 8. I've had LASIK eye surgery but still wear glasses. 9. I live in a house that I'm buying. 10. I'd like to have a man in my life, but I'm pretty set in my ways, so it may never happen. 11. I haven't taken very good care of my teeth. 12. I thought I was a cat person until I got my first dog, Rosie, a miniature dachshund. 13. If I had a lot of money I'd give a lot of it away to close friends, immediate family, and charities. 14. I have suffered with depression all my life, but have found medication that makes me feel like a relatively normal, happy person. 15. My first car was a 1965 Chevelle Malibu. It's the only car I ever named. It was named "Ernie," after the Sesame Street character. 17. Sometimes I enjoy drinking beer. I used to hate it. 18. I've always wanted to own a 1957 Thunderbird with the portholes. 19. I almost never answer the phone. I don't like talking on the phone. 22. I enjoy listening to K-LOVE, a nationwide Christian radio station. 23. I'd like to do more gardening. 24. I once tasted Cray computer juice (the liquid that Cray uses to cool their computers). 25. I used to own a motorcycle and would like to again. 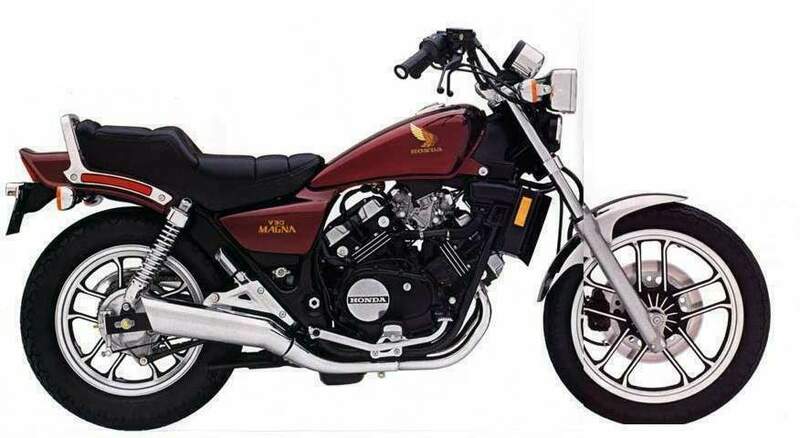 It was a Honda V30 Magna. 26. I have this strange fascination for bugs. I should probably have been an entomologist. 27. I'm most definitely a night person. 28. I've been stationed in Germany four times. 29. I speak a little German and less Russian. 30. I really enjoy creating web sites. 31. I very much hate housework, especially washing dishes. 32. I'm an ordained minister. Really. 33. I don't celebrate Christmas. The reason(s) can be found here. Ditto for most other holidays. 36. I enjoy working with power tools. 37. I painted the entire inside of my house myself, and I refinished the kitchen cabinets and wainscoting. 38. I have two associate's degrees, one in liberal arts and one in advertising and graphic design. 39. I did poorly in high school, but I graduated. 40. People who treat their pets badly, including ignoring them, annoy me to no end. Their actions should, in my opinion, be illegal. 41. I have a low tolerance for stupidity. 42. The 2008 presidential race stressed me out like no other. Now I've decided to involve myself less in political stuff. 43. I've never owned a computer that ran Windows. I went straight from DOS to a Mac. 44. I've smoked off and on during my life, but was never addicted. I don't smoke anymore. The last time I did was over 25 years ago. 45. I don't believe there is a literal hell. 46. I regret that I was never smart enough to save any money. 47. My favorite color is green. Orange runs a close second. 49. My favorite soda is Diet Mountain Dew. 50. My favorite group is Steeley Dan. 51. My favorite female singer is Phoebe Snow. 52. I don't have a favorite male singer. 53. I'm the founder of the Umbrella Hat Society. Please join. It's free and it's fun. 55. I've owned a total of 11 cars and one motorcycle (so far). 56. I prefer Leno over Letterman, although I don't watch either. Now I watch Nightline. 57. I drive better than most people. I really do. I used to teach the National Safety Council's Defensive Driving Course. 58. I flunked U.S. history in high school and had to retake it during summer school. I got an "A" in algebra. 60. I saw Ernest Borgnine in an airport once. 61. I don't like it when men shave their heads. White men just don't look right with shaved heads. They look like giant thumbs. Partially bald doesn't bother me. 62. I prefer to wear my hair long, but sometimes get it cut short. 63. I've seen all of the main Star Trek (The Original Series) characters/actors live with the exception of William Shatner. 64. I have a male pen pal who is in a Texas state prison. 65. I quit buying "gossip magazines" after Princess Diana's death. I won't even buy "People Magazine" unless it's a special issue that interests me. 66. I throw too much food away. Usually fruits and vegetables, because I don't get around to eating them before they go bad. 67. I saw the comedian Gallagher live once, when I lived in Fayetteville, North Carolina. I sat in the sixth row. Since I was familiar with his act, I took along a large plastic dropcloth to avoid the mess. 68. I saw "Fahrenheit 9/11" in Crawford, Texas (the western whitehouse), on July 28, 2004. President Bush was in residence at his Crawford ranch at the time. 69. I've driven a British car with right-hand drive, and it had a manual transmission. I found it surprisingly easy to drive. This happened many years ago when I was in Germany and dating an English soldier. It was a 1973 Triumph 2000. 70. I've been to Paris. I went many years ago to see the Paris Air Show. 71. I've been to London, Windsor Castle, Stonehenge, and Old Sarum. 72. I finally quit working my job in retail, which I hated. 73. I worked customer service for AT&T Mobile for about three months. 74. I have no interest in sports, but I used to love watching Joe Montana play football. 75. I've been on my own for so long that I no longer know how to shop for groceries to feed more than just myself. 76. I met Arnold Schwarzenegger in 1989, when I went to see the first annual Arnold Schwarzenegger Classic bodybuilding competition in Columbus, Ohio. 77. I'm a Trekker. I went to a Star Trek convention in Boston in 1979 and saw the actors who played Scott, Bones, Sulu, McCoy and Uhura. 78. I saw Leonard Nimoy in Boston in a play called Vincent, about Vincent Van Gogh. It must have been in 1981. 79. I recently joined the National Rifle Association. 80. I now have a second prison pen pal. He was an acquaintance before he was prosecuted. He is in a federal prison in Colorado. 81. I had a 40-pound tumor removed from my abdomen in January 2012. It was a benign ovarian cyst. I have pix on my Facebook page. I'll add more later. I'm trying to get up to 100. •Rosie (Female Miniature Dachshund) - Born 12/29/98, red short hair, the love of my life. UPDATE: Rosie passed away on February 17, 2012. I miss her terribly. •Celie (Female Mixed Breed Dog) - about the same age as Rosie. •Roscoe (Male Mixed Breed Dog) - about 8.5 years old. •Lucy (Female Cat) - Born approx. 3/01/01, black and white. •Gracie (Female Cat) - Born 12/11/02, white and orange. •Punkin (Male Cat) - about 6-1/2 years old, orange tabby. •Sweetie (Female Cat) - about 5-1/2 years old, gray with a hint of tortoise shell. •Mr. Eko (Male Cat) - a stray, about two years old, solid black. •Litter of four kittens rescued from a feral female: three boys and one girl, born approx. July 1, 2011. •"Whoops" litter of four kittens born on March 6, 2012; three boys and one girl; offspring of the female from the July 1, 2011, litter because I didn't get her spayed soon enough. My bad. •Male stray I'm calling Boo, because he's still kind of scared; an adult, gray cat, age unknown. •Male stray I'm calling Curly, because he has one curled ear; an adult, orange tabby, age unknown. •Male stray I'm calling Teenie, because when I first saw him he was a kitten in a group of adult cats; approx. three months old, gray tabby with a fluffy tail. This brings my total number of cats to 16! Too many! I accept cash donations if you want to help a poor veteran feed her brood! These are sites that I created.